President Cheryl Brickey called the meeting to order at 1:00 pm . Twenty three people were in attendance. Since several individuals were attending for the first time, each person introduced themselves. 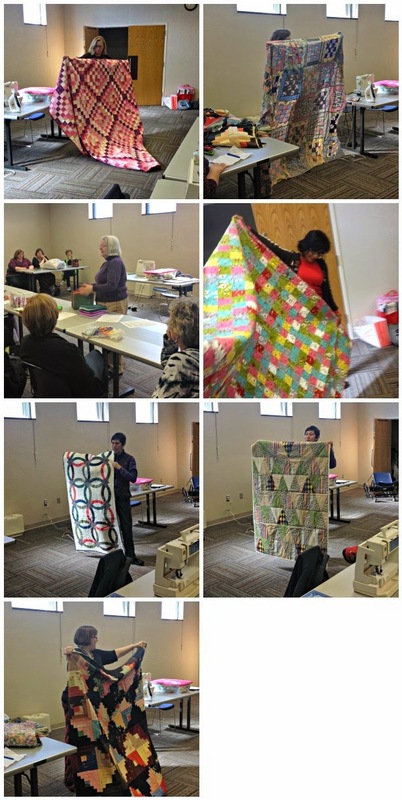 Cheryl stated that the Greenville Modern Quilt Guild is now a “starter” guild with the national organization. A group is working to craft a rough draft of by-laws to be discussed with all members at a future meeting for in-put and discussion. The goal is to become a member of The Modern Quilt Guild by June 2015. It has been announced that QuiltCon will be every year. QuiltCon 2016 will be held in California and QuiltCon 2017 will be held in Savannah, Georgia. Marilyn Hagopian introduced the next swap, an oven mitt, which will be held at the May meeting. The swap is totally optional – if you bring one, you take one home. Several patterns and tutorials are available on the Internet. More details will be posted soon. April: Big stitch hand quilting by Debbie West. Information and supply list will be in a later post. Everyone had fun at the ugly fabric swap which was held during our break. May quilters brought extra unloved fabric so that everyone got a chance to bring home some new (to them) fabric. This was such a fun activity that we are planning on repeating this swap in the fall. Christa Morgan taught the program on paper piecing and did a wonderful job. She had information hand-outs and simple patterns for paper pieced hearts for us to try. The pattern was used was a simple heart design. Everyone had a chance to try paper piecing and we even had a block or two finished by the end of the meeting. The meeting closed with a drawing for a book that was generously donated by Paige. We will see you all on March 7th at the Taylors Library for our next meeting! With 24+ people showing up to meetings, we have a very good problem that we are outgrowing our current meeting space at the Bernina Sewing Center. A number of people indicated that they really liked the Taylors Library facilitates so for the next few months we are going to meet at the Taylors Library. Please note that we had to change the date of the March meeting due to scheduling at the library. Three months from now, we will reevaluate our attendance and decide where to meeting going forward. 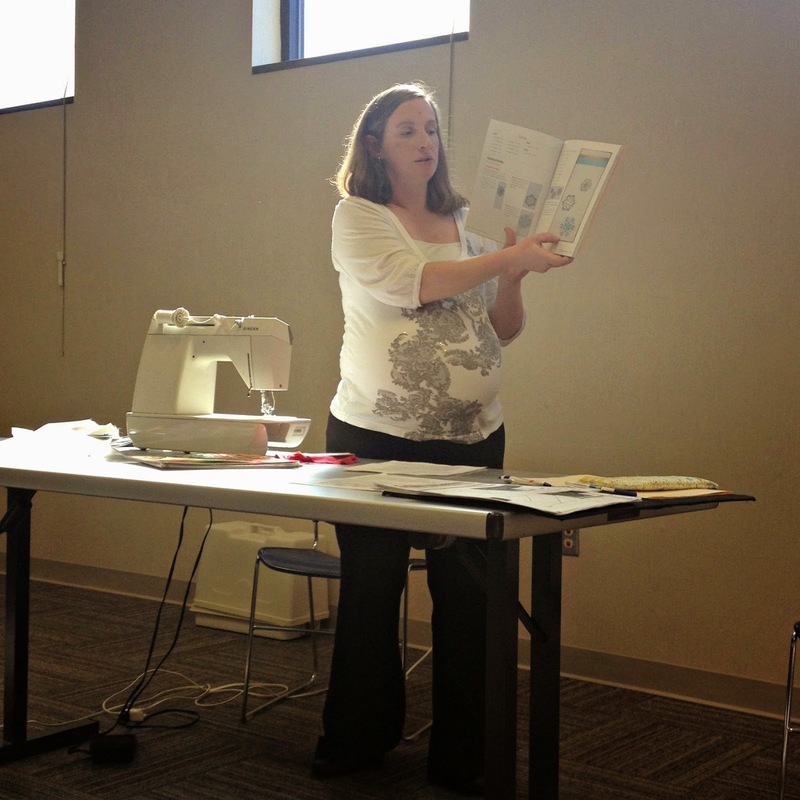 Bernina has been wonderful to us and we are so thankful they allowed us to hold our guild meetings at their store. We will be welcome to meet there in the future if we choose (and fit). 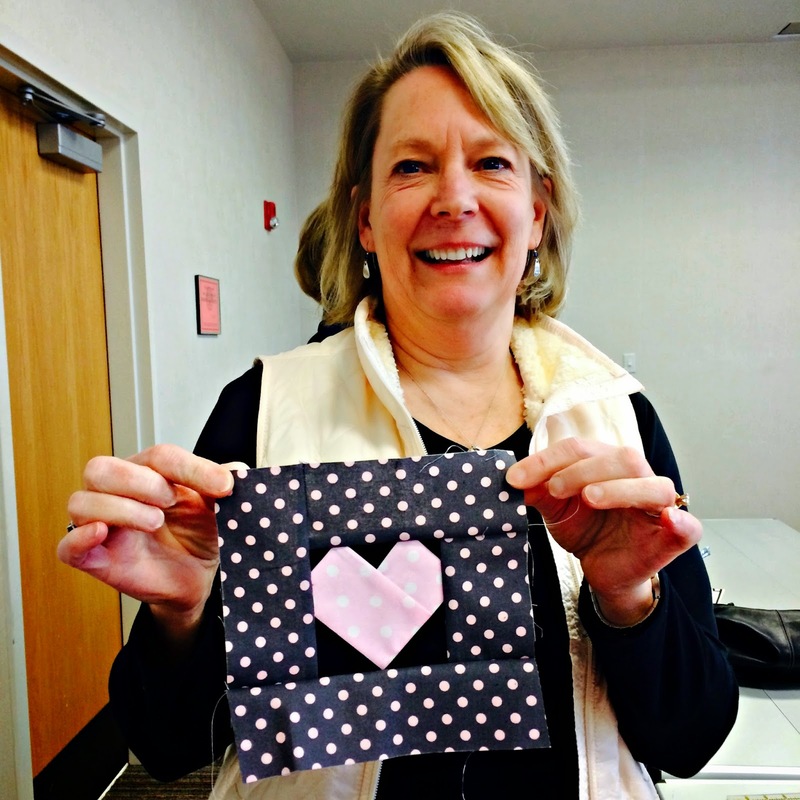 The February program will be on Paper Piecing presented by Christa Morgan. Bring your sewing machine and some scraps if you would to try out this sewing technique. 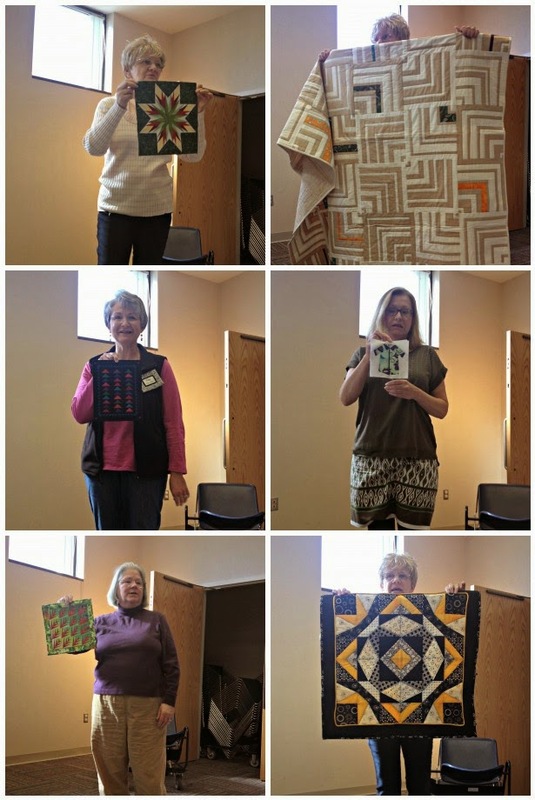 If you have any quilt blocks or quilts made using paper piecing, please bring them in to show the group in addition to our normal show and share. We will be also be having our first swap of 2015 to trade some of your old, unloved fabric for some new fabric! The fabric can be in regular 1/4 yard cuts or fat quarters. Fabric must be "good" quality cotton quilting weight fabric. Good quality means quilt shop quality or similar quality from JoAnn, Hobby Lobby, etc. Fabric can be any style: solids, prints, batiks, traditional, modern, floral, plaid, 30's reproduction, holiday, etc. Fabric can be washed or unwashed. I hope to see you all this Saturday! (If you have any questions, you can e-mail me at cheryljbrickey (at ) gmail (dot) com or leave a comment on this post).